Picture of the first full-time porpoise trainer: Andre Cowan. He was from Tahiti and is buried there. 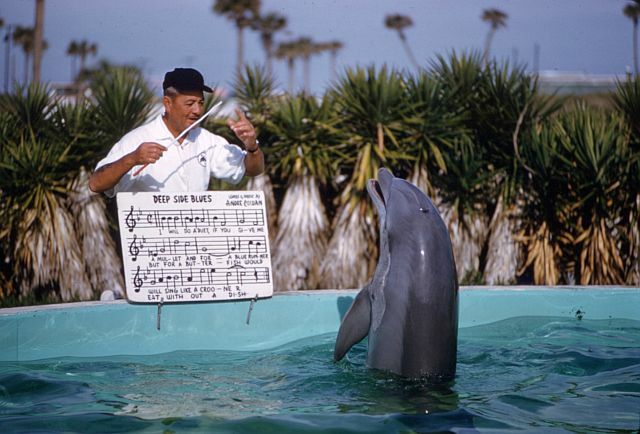 When Marine Studios started to train porpoises they hired an animal trainer by the name of Keller Breland. I think he was from Arkansas and had never trained anything but dogs, etc. Then Andre came on board, then Lester Taylor, then Fred Lyons. Announcers were: Greg Masters, Ed Doyle, Phil Cochran, Cecil Walker. Greg and Cecil were assistant aquarists (in charge of shows and maintenance of the oceanariums/stadium). Dave Redman also did a few shows during the summer of 1959.